“Few can deny the influence of early environment, and it was in a house just outside Florence that I first opened my eyes in 1904”. – Harold Acton, Memoirs of An Aesthete, 1948, pp. 2- 3). 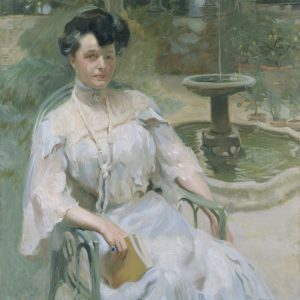 In May 1903, after a three month journey through Italy (Umbria, Emilia Romagna and Tuscany), Hortense L. Mitchell, daughter of a prominent Chicago banking family, and her husband Arthur M. Acton, ‘dilettante’ painter, collector and interior designer, associate of Stanford White and Stefano Bardini, took up residence at La Pietra, a Renaissance villa, originally built for the humanist Francesco Sassetti, friend of Cosimo de’ Medici. Arthur and Hortense were passionate travelers and Arthur loved motorcars: they were often photographed in these early years in front of their villa, or visiting other historical properties, with their Fiat, a symbol of wealth and modernism. 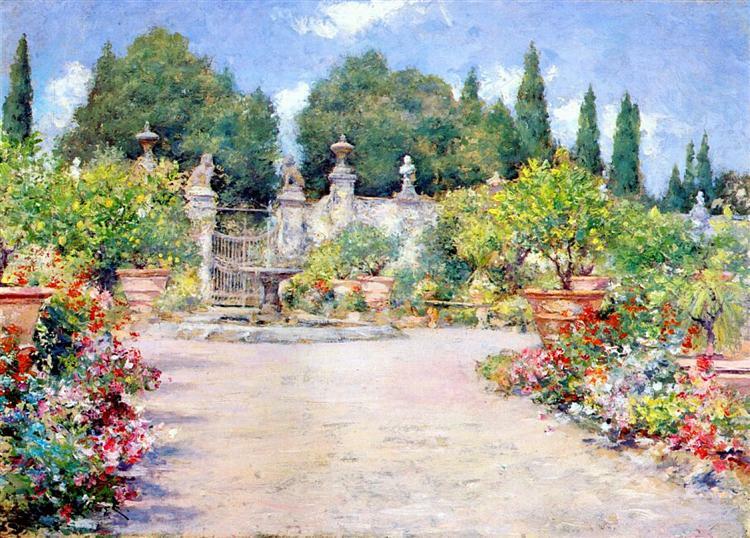 In 1907 after the birth of the children, Harold and William, and one year before A Room with a View was published in London, Hortense bought the villa with 37 acres of agricultural land to cultivate, old case da contadino to restore and an English style garden to re-design in Neo-Renaissance style. 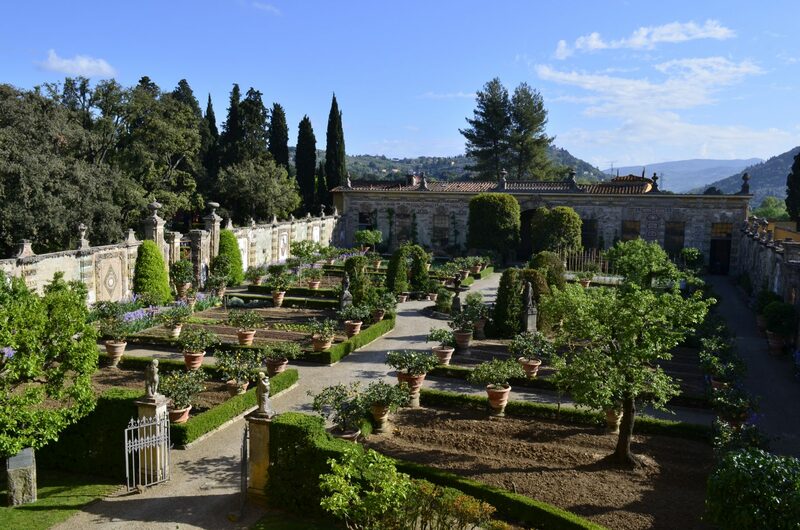 One of the main features of Villa La Pietra is still today the strong bond between the house, the art collection with its six thousand objects, the symmetrical garden, perceived as a natural extension of the house, and the Tuscan landscape which surrounds it. Paintings in the collection such as the seventeenth-century Villa d’Este with Garden View or Giorgio Vasari’s Holy Family were hung in the rooms so that they could be seen through the windows from the outside, thus connecting the interior setting with the exterior world. Eighteenth-century statues from the Veneto in the garden mirrored the frescoes in one of the rooms of the villa from the Capponi era with their neo-classical ruins, again insisting on the dialogue with the garden and on the eternal cycle of time and revival. From one of the windows on the south side of Villa La Pietra, once a nursery where Harold and William would have fun dressing up in theatre costumes (recorded in photographs today preserved in the Acton Photograph Archive), the Actons could enjoy their own particular view of Florence seen through a frame of newly planted trees. The city deeply influenced the life of the family. Hortense and Arthur interacted from the very early years with both the local Florentine families (Salimbeni, Gamba, Antinori, Costantini, Caetani) and the large and vibrant international community (Frederick Stibbert, Charles Loeser, Francesca d’Orsay, Lysina Rucellai and many others). 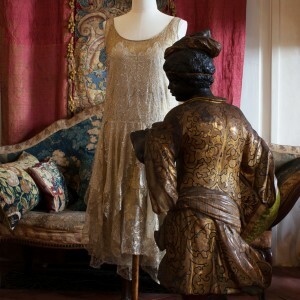 Famous parties were held in La Pietra gardens, where guests attended dressed as Venetians or in exotic fancy dress in the style of the fashion designer Paul Poiret, who in 1914 created Persian costumes for the Acton couple. Harold in his Memoirs (p.9) quotes the Goncourt brothers in 1856 who had found the town a “Ville toute anglaise” and, referring to the years of his own childhood, he records that so many English-speaking travelers “took root among the vineyards and became a part of the landscape”. 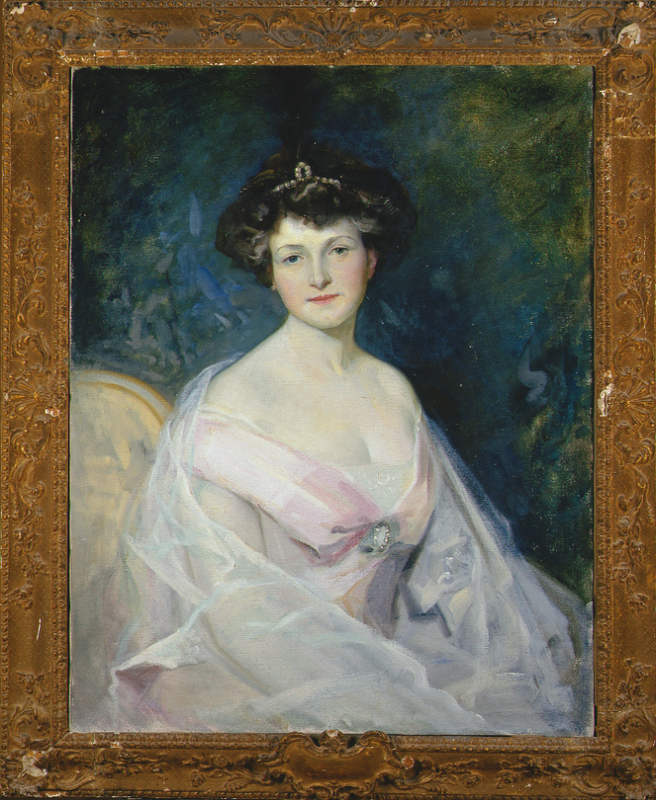 An oil painting dating from between 1907 and 1910 by James Montgomery Flagg, an artist friend of Arthur from New York, is preserved in the Acton Collection. It shows Hortense, in a white summer dress, seated with a book totally at her ease in the vegetable garden, the Pomario. The painting is presented to the public for the first time on this occasion after its recent conservation by Jean Dommermuth, NYU IFA Conservation Center Painting Conservator working for Villa La Pietra. The work provides a very important historical record of this area of the garden. Several aspects, including the fountain, have since been changed. The two stone sculptures of large catlike animals (lions?) on the pillars on either side of the gate are like the ones, now in storage at the villa, originally from the Boboli Gardens. 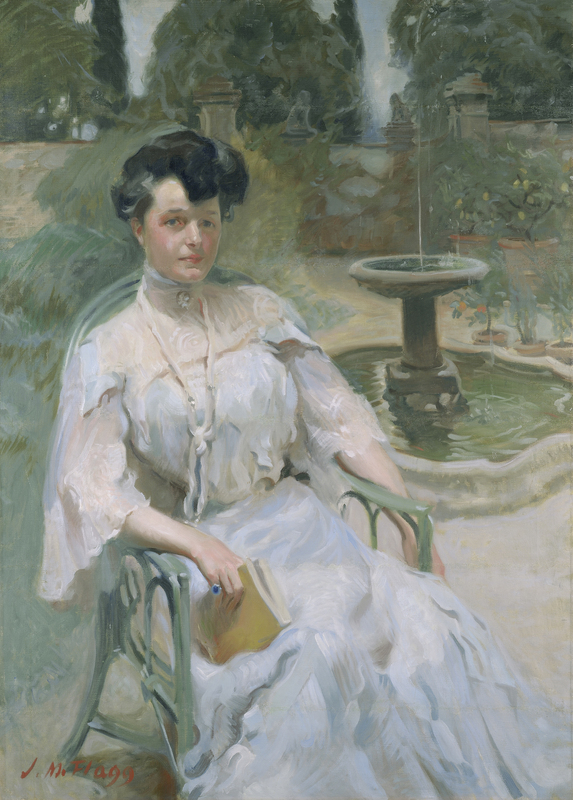 In this Portrait by Flagg the Pomario is exactly as depicted in a painting entitled An Italian Garden, by William Merrit Chase, now in the Chrysler Museum of Art in Norfolk, Virginia. Chase was another close friend of the couple, who visited the Villa and painted a portrait of Arthur Acton, still preserved in the Acton Collection. “Dear Mr. Stibbert, It was most kind of you to think of me and let me take that beautiful book of costumes. The prints are extremely quaint and interesting and may help me out if my dressmaker has not found just what I need […]”. – Hortense M Acton. Letter to Frederick Stibbert. 1904. MS. Museo Stibbert Archive, Florence, Italy. This short note of thanks to her friend and neighbor the British collector Frederick Stibbert, indicates that Hortense Mitchell Acton was investing time and money into shaping her new role as the owner of Villa La Pietra, and her new wardrobe reflected her refined cosmopolitan taste. 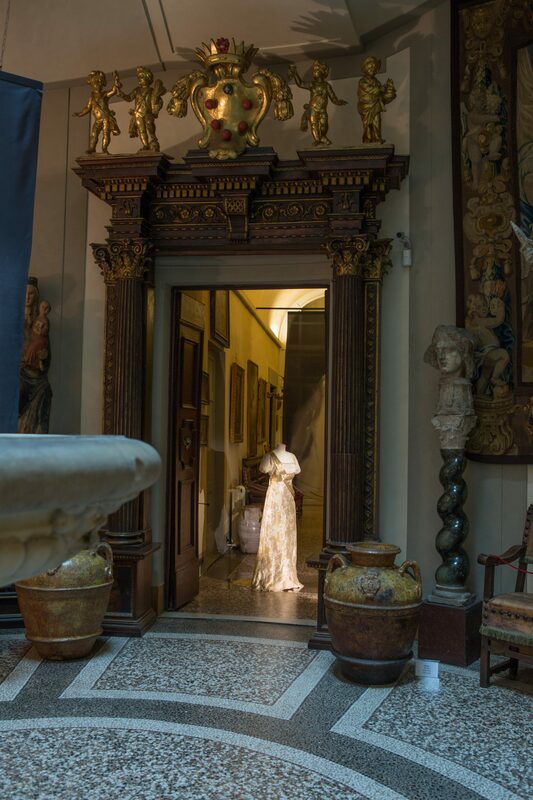 Her expensive French outfits, Chinese robes, kimonos and kaftans, a few hats and accessories, as well as fifteen pairs of shoes, all preserved today at Villa La Pietra, form a collection of over one hundred objects. The collection was examined in 2004 by Chris Paulocik, former Textile Conservator at the Metropolitan Museum of Art together with students from the Conservation Centre at the NYU Institute of Fine Arts. 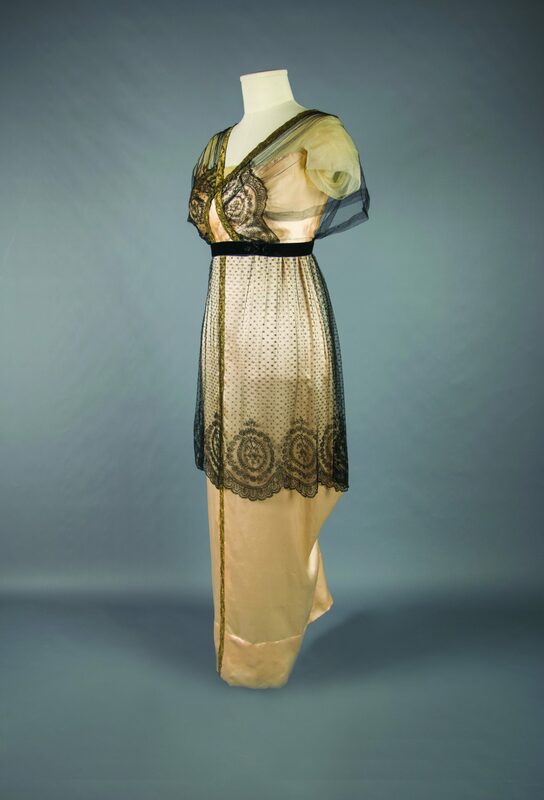 Their survey identified a very important group of thirty-eight European dresses, and among these twenty-one designed by the Maison Callot Soeurs, dating from between about 1907 and the late 1930s: there are afternoon and evening dresses and a few very fancy party costumes, showing both the radical evolution in womens fashion from the Edwardian age to the Twenties, and the change in Hortense’s figure (at first she was size 38 and in middle age her fitting was 44). 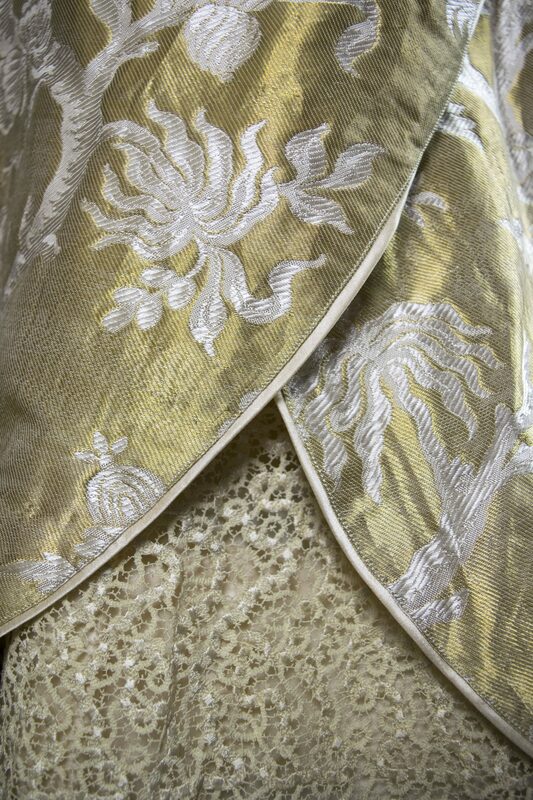 The dresses were clearly all custom-made for Hortense: very few have been found to exist elsewhere with precisely the same design and pattern. 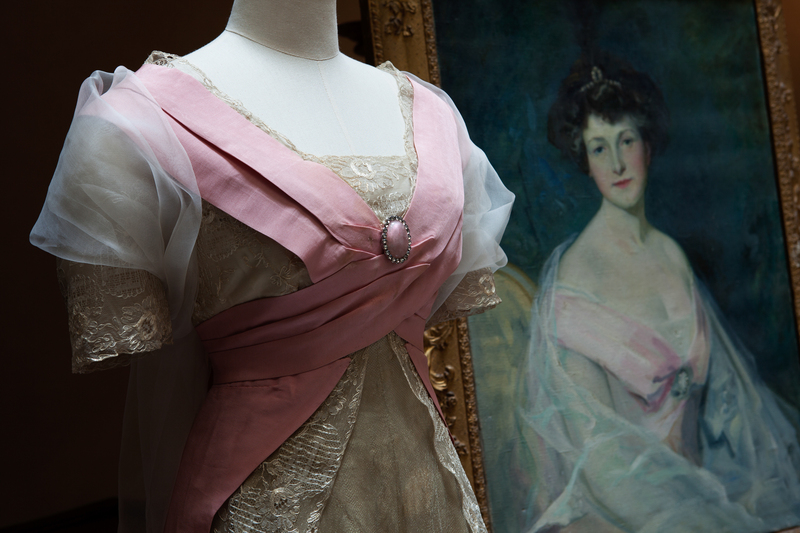 The Callot Soeurs garments in the Acton Collection incorporate many of the familiar characteristics produced by that fashion house: pastel colored tulle, antique fabric and lace, rich brocade, silver and gold lamé, lavish embroidery which includes sequins, and bead- or ribbonwork. The patterns, fabrics, and shapes show Oriental influence. 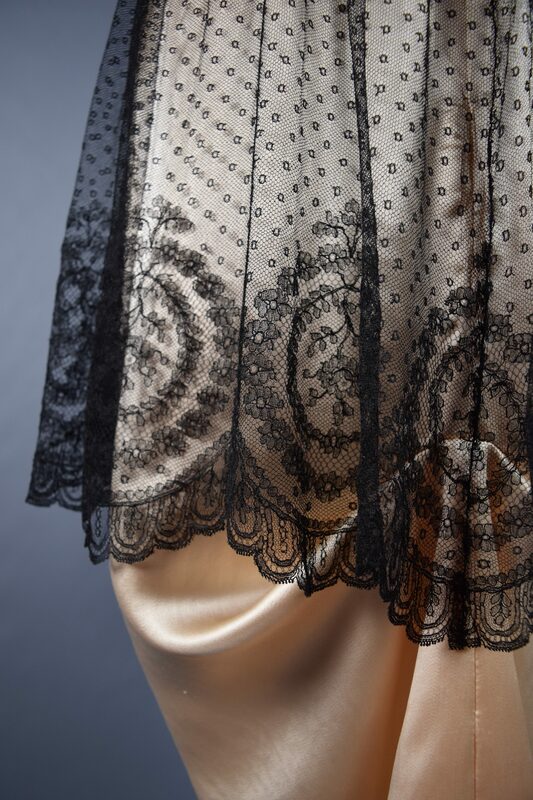 Established in 1895 at 24, rue Taitbout in Paris, by the four Callot sisters as a lingerie and lace business, Callot Soeurs evolved into a premier ladies fashion house in the early years of the 20th century. Madame Gerber, the eldest Callot sister, filled the role of the principal designer until 1927. The business also attracted other talented designers, one of whom was Madeleine Vionnet who founded her own fashion house which soon became famous. 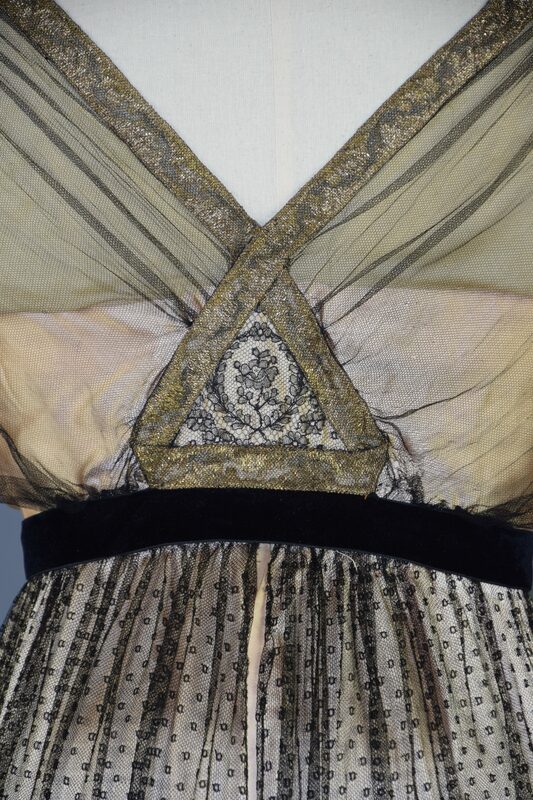 In 1937 Callot Soeurs closed down and was absorbed into the House of Calvet. 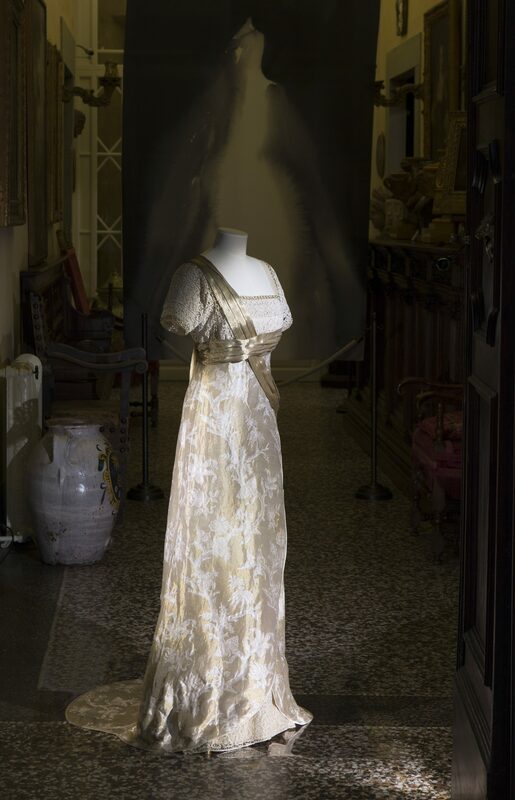 After minimal conservation treatment to ensure their stability for temporary display, three of Hortense’s evening gowns dating from between 1907 and 1912 are now presented to the public at Villa La Pietra, on the occasion of the citywide commemoration of the release in 1986 of the Merchant Ivory Productions film A Room with a View. 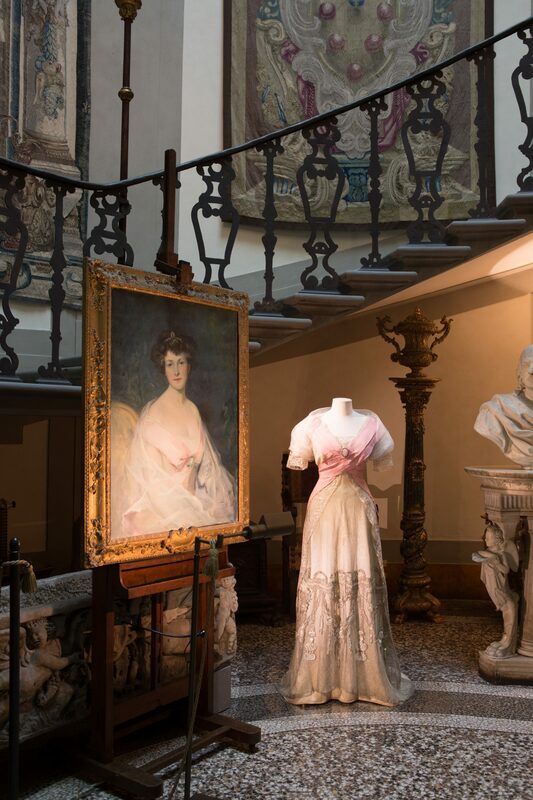 The conservation and the installation of the dresses was carried out by the textile conservators Claudia Beyer and Costanza Perrone Da Zara, with the assistance of Irene Caputo. Before beginning to prepare a costume for display many factors have to be taken into account, such as the condition of the garment, the need for consolidation treatment, the availability of an appropriate mannequin, the dressing and the environmental conditions in the exhibition space. 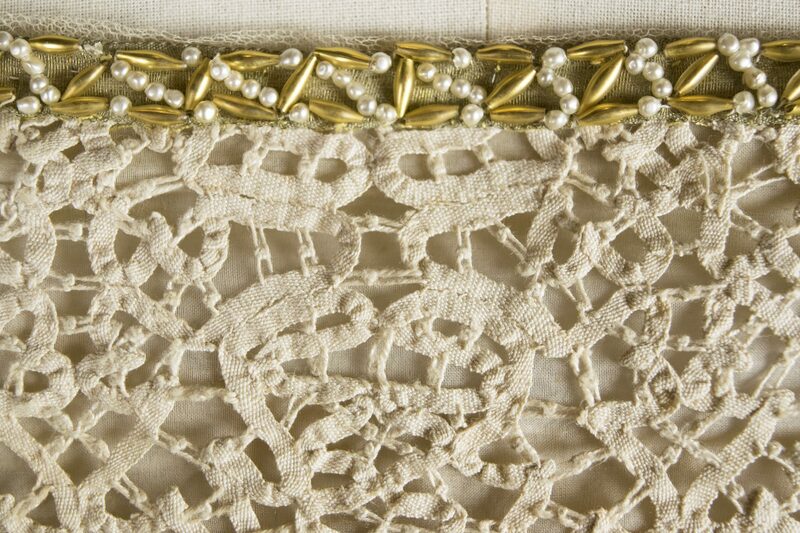 Our role is to stabilize the garment so that it will not deteriorate while it is on public display. Costumes are very fragile because they are made of a number of different fabrics and other associated materials, like metal threads, sequins, glass beads and rhinestones. 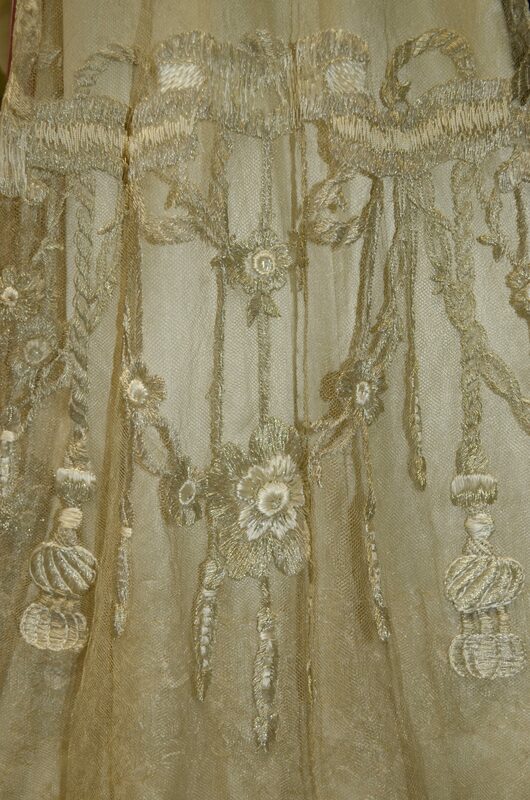 Often heavy layers are attached to very light tulles and chiffons, so these fabrics have deteriorated even more. Metals can corrode, tarnish and dull over time, so these additional materials can stain the surrounding fabric. 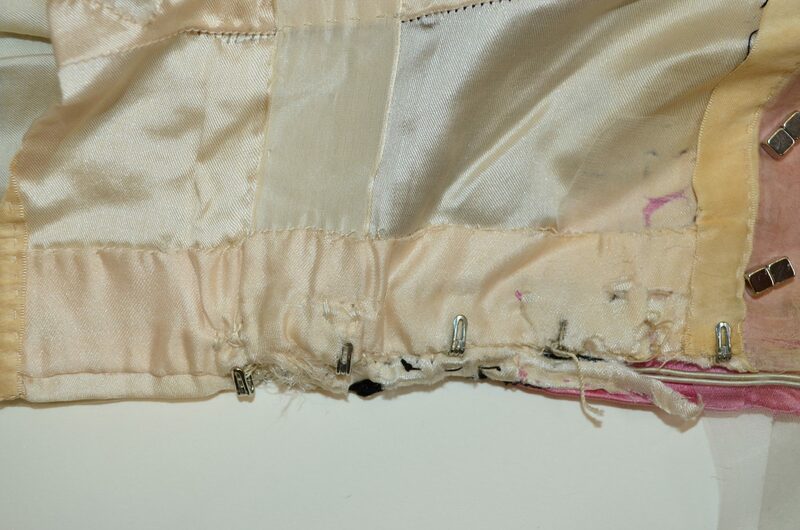 The lining of the bodice of the dress can become very fragile and degraded through wear and tear. The fabric fibers can fade and yellow and become very brittle. There can be food spills of non-identifiable origins and perspiration stains. The sewing threads can also become brittle. Gloves or clean hands are essential for a safe handling. The first important step in the conservation process is the examination of the costume as a work of art: photographs will be taken, research carried out, measurements taken, techniques and materials will be identified. 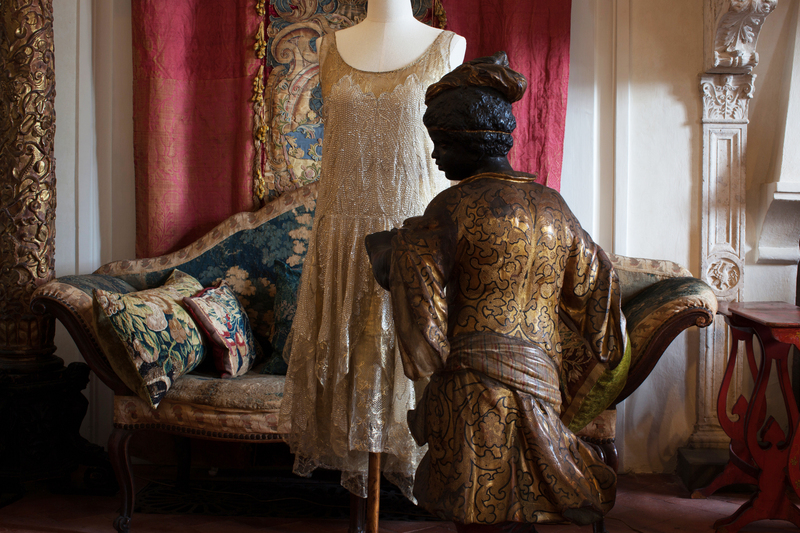 If a costume needs to be displayed it has to be supported on a mannequin fitted to its particular silhouette so that it can express accurate information about the fashion and customs of its period. During the consolidation stage through a minimal treatment we focus on the fabric’s mechanical fragility. To provide additional strength and cohesion to the original fabric we often apply a double layer of a very fine silk fabric, on either side of the original as in a sandwich. We regain volume and release the creases using an ultrasonic humidifier which controls and directs the necessary moisture, taking into account the different materials. At this stage we also, where possible, remove stains. Once the consolidation is completed, we proceed to build the mannequin, which is very important since it can restore the garment to life. Unlike a dress designer or a seamstress who fits the dress to a body, we make a body that fits the dress. 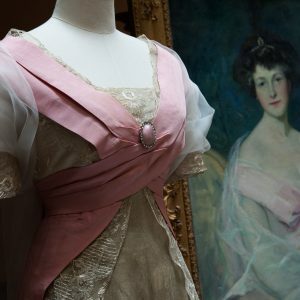 The dresses presented on this occasion date from the Edwardian era, when fashion was still dictated by the S silhouette created by a corset with a restrained waist, that propelled the high bust forward and the hips backward. We usually start with a smaller mannequin and in order to build volume we add wadding that is held in place by a cotton stretch fabric. 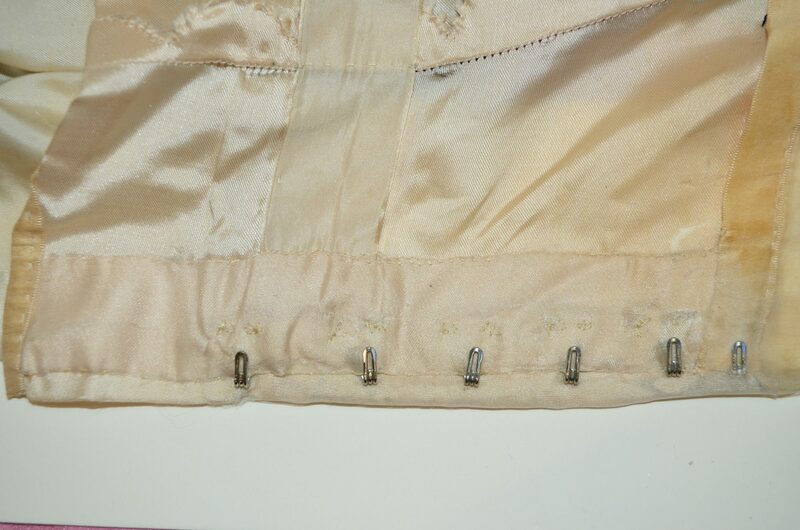 Tacking stitches are used for additional support. When a costume needs arms we create them on the mannequin. The additions and modeling are carried out until the mannequin is the right size and silhouette for the garment. 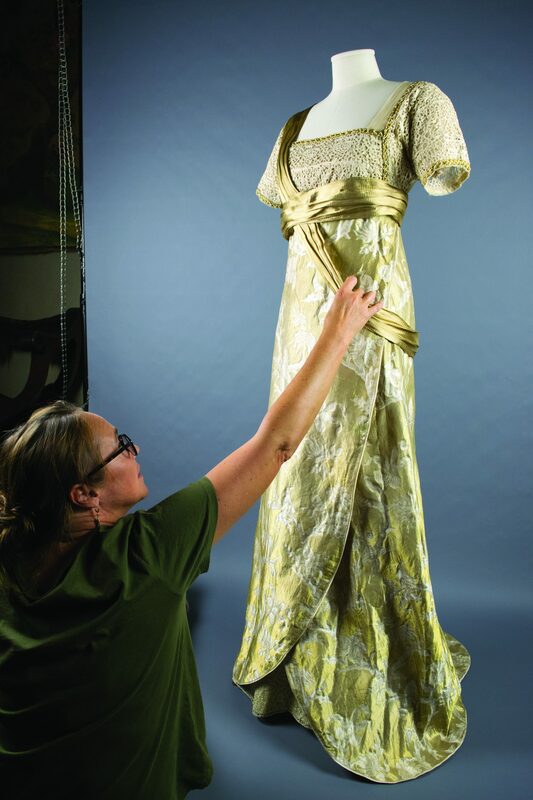 When all the precautions have been taken and the dress fits perfectly on the mannequin our mission is accomplished, and this is always an exciting moment in the conservation laboratory. E.M. Forster visited Italy in 1901 and 1902 and found Florence already full of Anglo-American Florentines. In A Room with a View he perceptively describes Mr. Eager as “a member of the residential colony who had made Florence their home…Living in delicate seclusion, some in ….. Renaissance villas on Fiesole’s slope, they read, wrote, studied and exchanged ideas, thus attaining to that intimate knowledge, or rather perception, of Florence which is denied to all who carry in their pockets the coupons of Cook”. When the novel was published in 1908 Hortense Acton had just purchased Villa La Pietra, and she and Arthur were busy furnishing it as their family home, fast becoming members of that colony Forster describes. They acquired the second printing of A Room with a View in 1909, still today a precious item in their library. James Ivory’s film adaptation (1986) of Forster’s book aptly used the grand Villa di Maiano as a setting (restored by the Englishman John Temple Leader as his first residence in the mid 19th century when he transformed the stone quarries of pietra serena at Maiano into cypress woods which are still a feature of the landscape here). The Maiano crossroads remains much as it was in Forster’s day. In his novel the view of Florence (“far better than the hackneyed view from Fiesole”) which the visitors are taken to see seems to have been that from the old road which runs along the hillside between Fiesole and Settignano via Maiano. Close by a path still descends to Via del Palmerino named after the villa where the English writer Vernon Lee (Violet Paget) lived most of her life. She drew inspiration from the countryside around her house, where she would often walk or ride. A third edition of her Genius Loci (which is in the Actons’ library) came out the same year as A Room with a View. Admired by Henry James (who would visit her here), Vernon Lee was a founding member of the society for the protection of the historic center of Florence. On her death in 1935 part of her library went to the British Institute. She had a somewhat stormy relationship with the great art historian Bernard Berenson who was a neighbour in Ponte a Mensola below Settignano, still quickly reached from Maiano along a lovely country road. The formidable Janet Ross also lived in this little valley at the Villa di Poggio Gherardo, and the Berensons, having rented Villa I Tatti from Temple Leader, got married from her house just a year or so before Forster came to Italy, at the time when her Leaves from our Tuscan Kitchen was published. Lina Waterfield, her niece lived with her here and was one of the founders of the British Institute, together with Arthur Acton (the library is named after Harold Acton, who provided it with its splendid premises overlooking the Arno). Across the Mensola stream, the Casa di Boccaccio was rented by Edward Hutton while writing his delightful Country Walks about Florence (dedicated to Janet Ross) which came out the same year as A Room with a View (the Actons were quick to purchase this first edition, too). Hutton was also involved in the earliest days of the British Institute. In 1979 a new Italian translation of A Room with a View was entrusted to Marcella Bonsanti, a Florentine much admired as a translator of some famous Anglo-American authors who spent time in Florence (including Henry James and Nathaniel Hawthorne) and she also provided the Italian editions of Harold Acton’s Memoirs of an Aesthete and Italian Villas. Harold, historian and self-styled aesthete, is remembered as perhaps the most distinguished member of the Anglo-American community in Florence in the second half of the 20th century and he was also bestowed with honorary citizenship by the town.